We added nine Radar Horses to our watchlist from last week's races. Our Radar Horses improved on their average outing and ran a final time that ranked above the class of the race. Consider it our horses to watch list and we'll let you know through our Radar Pages when these "standout" performers are racing again. 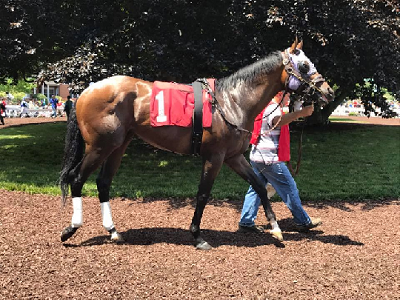 HIGH FIVE COTTON has been on a roll to start 2019, winning three in a row at Tampa Bay Downs after finding the winners' circle twice in 18 races last year, mostly competing at Monmouth Park and Penn National. His latest win was by a commanding 10 lengths after running third in the first 2-furlongs. Then he turned on the jets. His winning 6-furlong dirt time of 1:09.80 was a touch slower than $100,000 Stakes winner KILLYBEGS CAPTAIN's 1:09.66, although HIVE FIVE COTTON may have more considering he probably left some on the table with a 10 lengths lead. BOUNDRY PASS broke his maiden in his third try at Tampa Bay Downs on March 17, 2019. 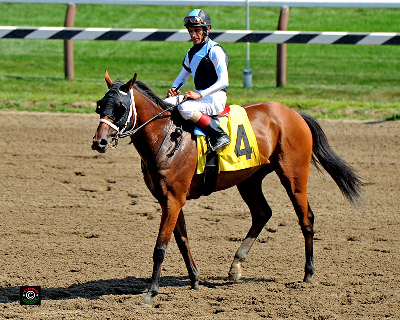 He won in run-away, wire-to-wire fashion, stomping a field of eight horses by 9 1/4 lengths. He battled for the lead in the opening quarter, besting CHASE RUNNER by a head. BOUNDRY PASS led by 3 1/2 lengths at the 1/2 mile-marker and pulled away from the pack in the stretch. His final time for 1 1/16th on the turf was 1:40.98, which is the fastest time in more than a month for the distance/surface. He'll be a serious contender in his next outing if he can run the same race. DUNDALK is another impressive Tampa Bay winner, taking the crown from gate-to-wire in an Allowance $22,500 at 1-mile on the grass. He popped out of the gate with a quick first step, leading by 2 1/2 lengths at the quarter-pole. From there, he was challenged by last-place finisher, CHEYENNE'S COLONEL, from the 1/2 mile call through 6-furlongs. DUNDALK took charge in the stretch and coasted to the wire. His running time of 1:34.33 was the fastest in the last 35 races at the distance/surface. ITSAGIMME'S GIRL is our fourth Tampa Bay Downs entrant. She ran a race where she was second until the half-mile marker before taking over from LADY ALIDA. Jockey Antonio Gallardo asked for more on the turn and she responded, drawing away by 5 lengths in the stretch and settling for a 3 1/2 length score. Her final time of 1:41.66 was the third fastest on more than a month at the distance/surface and was the fastest in the same time frame for Claiming $13,700. HONEY DON'T got his second W in his last race, a $24,000 Claimer at 1-mile on Gulfstream Park Turf. He rated off the leaders, running third for the first 1/2-mile. After he moved to the rail, he took the lead from GEMOLOGISTER with a quarter-mile to run, eventually winning by 3 lengths. His final time of 1:35.38 put HONEY DON'T in company with recent $51k Allowance, $38k Starter Allowance and $100k Stakes winner. MISSION DRIVEN is another horse that's found his form in 2019, finding the tape first in three straight at Gulfstream Park. Prior to his recent form, he won four races in his previous 23 outings. On March 16th, he started seventh in a 10 horse field, staying in that spot for the first half-mile. Swerving from the rail and out and back inside, he passed SQUADRON, COULD BE, and FRANKLIN TOWERS in the stretch to close out a 1 1/2 length victory. MISSION DRIVEN's 1-mile turf time of 1:35.12 is the fastest Claiming $28,000 figure in the last six weeks. The number is on par with recent Allowance and Stakes winners. ONE MAN PARTY knows only one thing: winning. The three-year-old is undefeated in two Oaklawn Park starts. In his most recent, Claiming $45,000 at 6-furlongs on dirt, the determined young colt battled for the lead for the first half-mile with SAMBUCCA, each no more than a head ahead of the other. Jockey Ricardo Santana, Jr. asked ONE MAN PARTY to hit the gas in the stretch and he responded, pulling away by 4 3/4 lengths at the wire. His final time of 1:10.30 is squarely in the Allowance $80,000 and up range. Expect ONE MAN PARTY to run for the big bucks soon. SECRET HOUSE looks like a horse for the Oaklawn course, scoring three of his seven wins at the Hot Springs, Arkansas track (FYI � don't speed by much when driving in Arkansas, they announce a "Zero Tolerance" policy and they apparently mean it.) Outside "The Natural State", SECRET HOUSE has four wins in 17 races. On the Ides of March, he won in wire-to-wire fashion, scoring a 4 1/2 length win at 1 1/16th-miles on dirt. His Claiming $45,000 winning time of 1:43.59 was only topped by Allowance, Stakes and a $100,000 Maiden Special Weight winner in the last month. WARRIOR'S CHARGE is our final Radar Horse to watch. He broke his maiden in his last start after finishing third in his previous three. He led the field from gate-to-wire, winning his Oaklawn Park, $100,000 Maiden Special Weight race (mentioned above) by 6 lengths. His running time of 1:43.17 was only bettered by the four Stakes winners on Rebel Stakes Day. That's impressive company. These nine horses are ones to watch as many could step up in class and offer value. Of course, we'll let you know when they are running again in our Horse Racing Radar section.